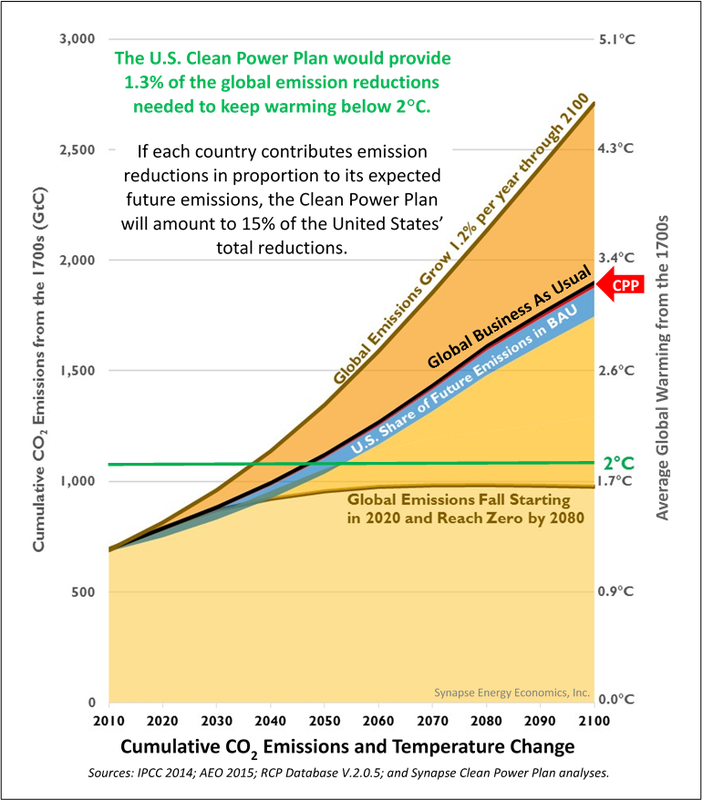 In the wake of the U.S. Supreme Court’s surprising and controversial decision to stay implementation of the Clean Power Plan—which limits the emission of carbon dioxide from existing power plants—here’s a bit of global context (see figure below). Continued emission of carbon dioxide and other greenhouse gases into our increasingly overloaded atmosphere leads inevitably to dangerous climate change: higher average temperatures, more irregular weather patterns including hurricanes, droughts, and heat waves, as well as rising sea levels and storm surges. In Paris this past December, the United States played an integral role in achieving a global pledge to limit global warming to 2°C. We stated our intention to contribute to this effort by reducing our emissions by about 25 percent by 2025. It’s a small first step in the direction needed—but still, an important step, and one that relies heavily on the Clean Power Plan for its success. The U.S. Environmental Protection Agency’s Melissa Harrison said it best: “You can’t stay climate change and you can’t stay climate action.” Every little step is needed, and ultimately decisions regarding how the United States will achieve these essential emission reductions must take into consideration not only the expected future profits from existing polluting infrastructure, but also consumer benefits from new energy efficiency and renewables, health impacts from carbon dioxide’s co-pollutants, and humanitarian (and geopolitical) considerations from climate damage in the United States and around the world.